I hope all of you had a wonderful time during Christmas and the New Year, enjoyed glorious food with your families and friends. Last week I put my family on a budget airline and flew to Chiang Mai, Thailand to spend a week. We had a fabulous time. 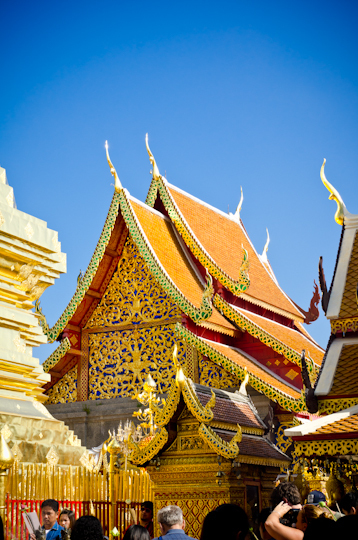 Chiang Mai is in northern Thailand, close to the border to Myanmar and Laos. You will find an amazing beauties and cultures of Thailand in this area. I thought I would share with you some of highlights on my trip to this exotic place. I love tigers. I think they are one of the most beautiful animals that God created. 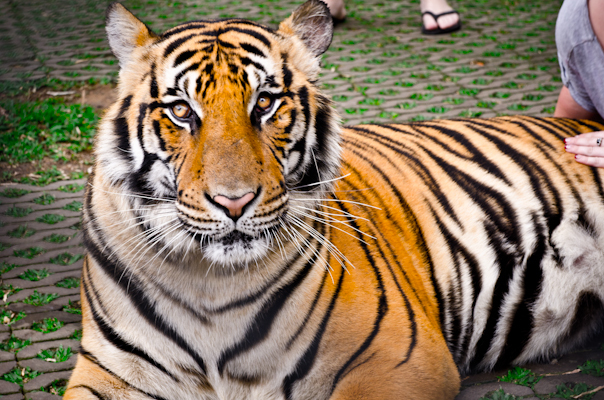 You can visit Tiger kingdom and pat the tigers as if they are your own pet. These tigers were born in the captivity and raised by humans. However you have to take many cautions to approach to these big cat. My heart melted when I saw this baby tiger and so did my little princess. She fed him and played with him. 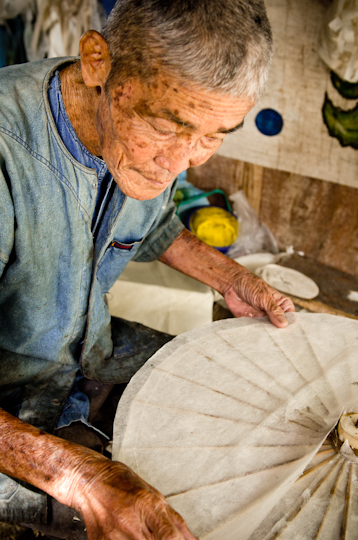 An old man making his umbrella…, from the umbrella village. 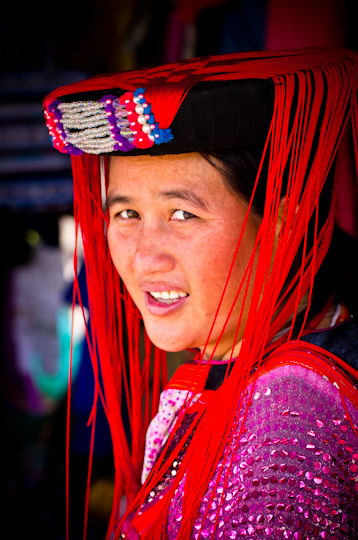 This lady is a Lisu tribe. She was selling handicrafts to tourist. 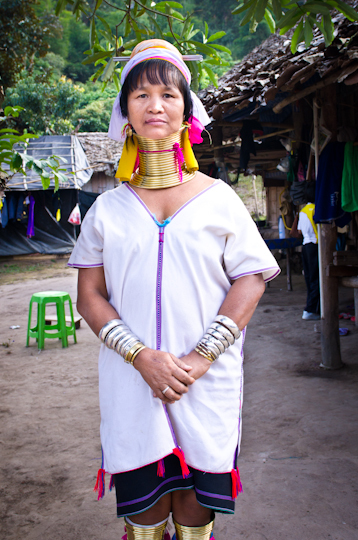 There are various tribes living on the hill side of northern thailand. They live closed to the border of Myanmar and Laos; Karen, Hmong, Lisu, Aka, Padaung, Lahu tribes are most well known among them. 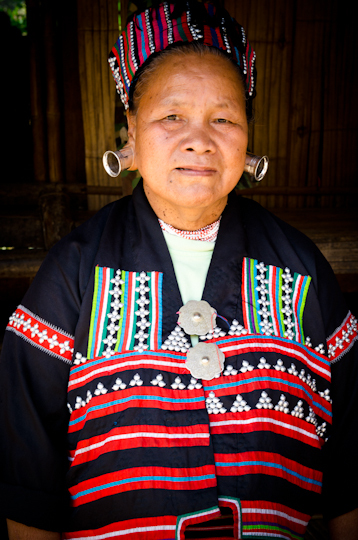 Each tribes has their own unique culture, language, and spiritual belief. They can be distinguished by their costumes. 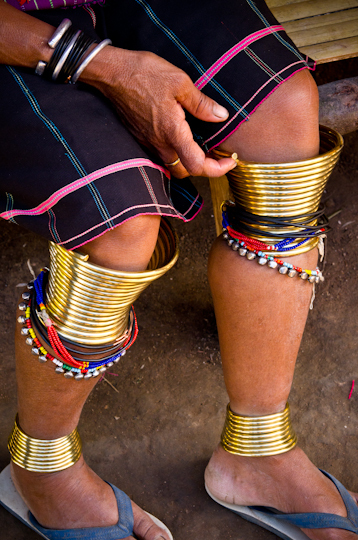 However, I learned that many of these tribes were brought to northern Chiang Mai for tourist. 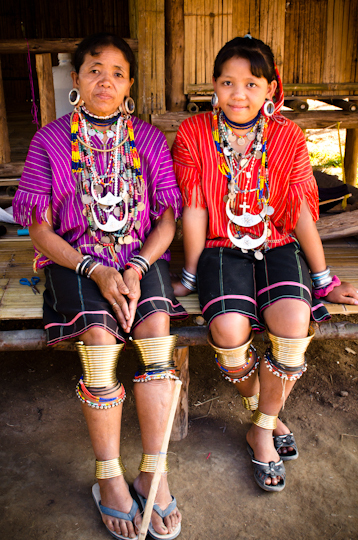 Their origin village is in an area called Ma Hong San, about 6 hours drive from Chiang Mai. I wish we could visit their hill side village to see their unique way of life but 6 hours drive to remote mountain with kids were not an easy thing to do. Instead We went to the area where Thai government brought them for the tourist. They get paid. You have to pay entrance fee to see them. These women are used to tourists. When I held my camera toward them, they stopped and posed for me. I had a little mixed feeling about it but they didn’t seem to mind to be exposed on everyone’s camera. Black Karen woman. 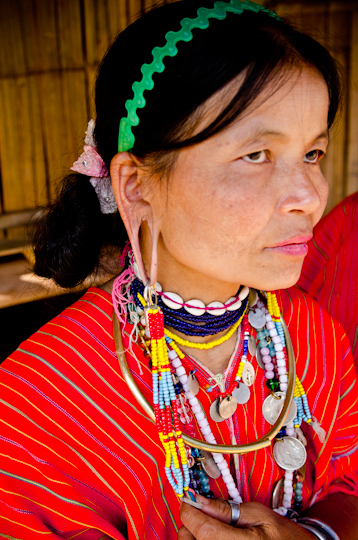 Karen tribes is the largest group on the hill. 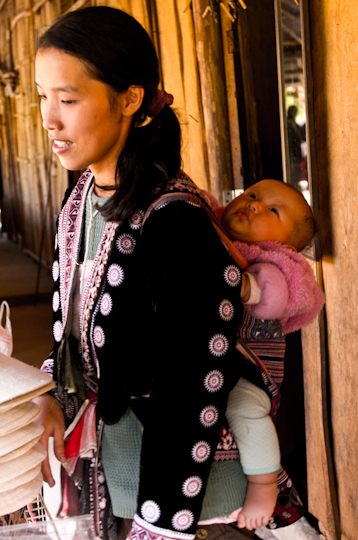 A young Hmong woman and her baby. She grow Marijuana plant to weave fabrics and sells. Mother and daughter posed together. Some Karen use heavy brass coil on their legs. And some on their neck. 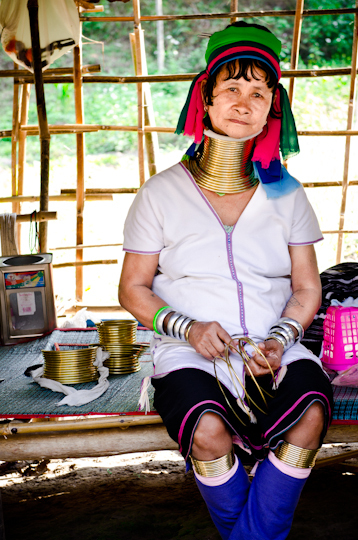 These women are known for long neck Karen tribe. Having a long neck is their symbol of beauty but it actually crushes their collar bones, which makes their neck looks longer but very weak to support without the rings. 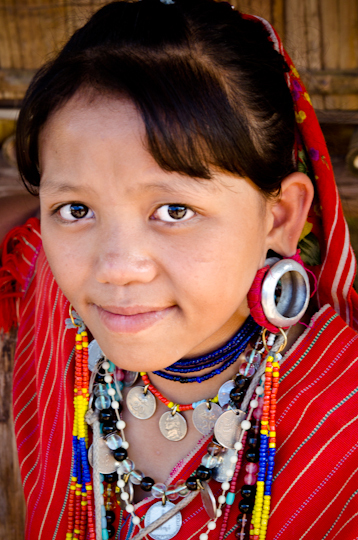 A beautiful young Karen girl. As I was talking with her, I suddenly heard the sound of baby crying. She pulled her baby out of tall basket next to her. Karen keeps their baby in the basket for them to sleep. Never thought about that idea! Interesting way to wear earrings. Beautiful Wat Prathat Doi Suthep. A Buddhist temple up on the mountain. Prayer from the sincere heart is always heard. A local monk near my hotel. 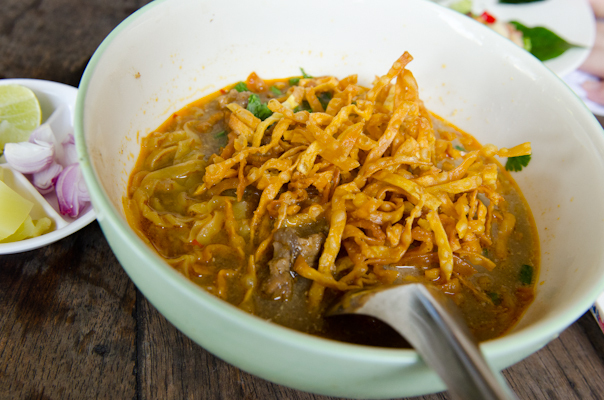 Khow Soi, the Chiang Mai curry noodle. It was only 40 baht (a little over US $1) and very delicious, adapted from Burmese curry which is influenced by Indian spices. Out of all the fun we had, the highlight of our trip was meeting a special boy and his family. He is an 8 year old elephant. My girl was bonding with Pu-chan. Pu-chan means moonlight; he was born under the full moon. He was the mildest, gentlest, and sweetest giant animal. She had to learn about his diet. Not that bad to touch them actually. It’s all fibers. She commended him to sit down and he did. 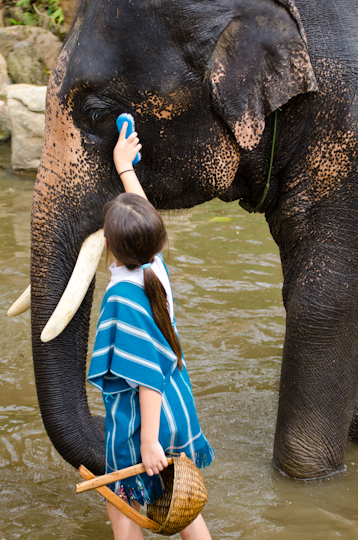 She brushed him to remove dirt since elephant requires lots of skincare. Pu-chan ate that brush afterward. Getting cleaned in the water…. Scrub, scrub, scrub along the wrinkles. I was afraid if he would start charging suddenly (some do). If he did I was going to take away his credit card, ha ha! 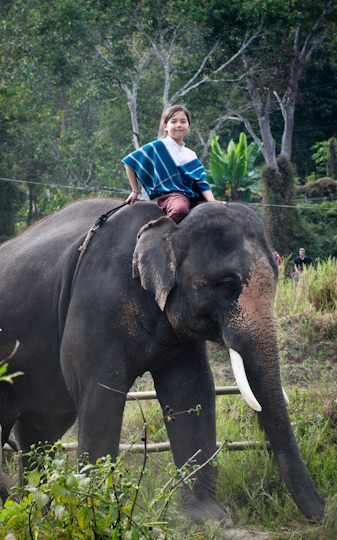 We went on forest trekking with our elephants up and down the hill. They often looked for food along the road since the forest is like “All you can eat Buffet” for them. Elephants are amazingly intelligent animal. They understand and obey to many commands. The baby elephants are so playful. 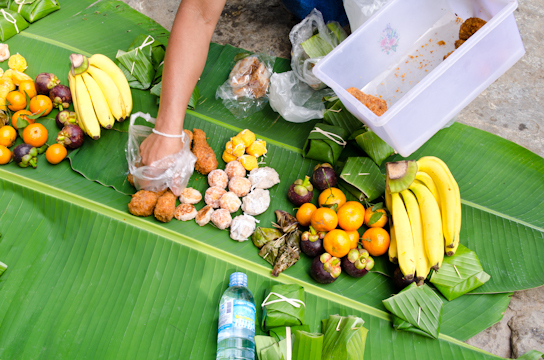 Nothing like having a banana leaf lunch near waterfall in the forest after the long trekking. 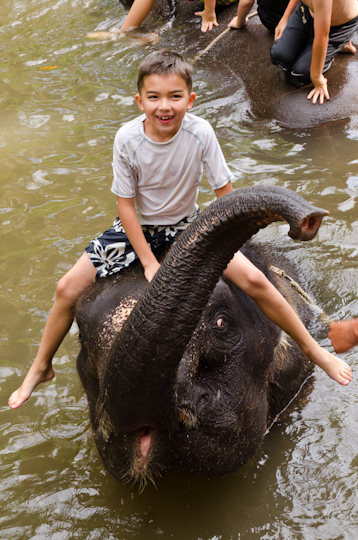 Swimming with elephants is one experience that my kids will never forget. I hope these elephants had great time as much as we did. 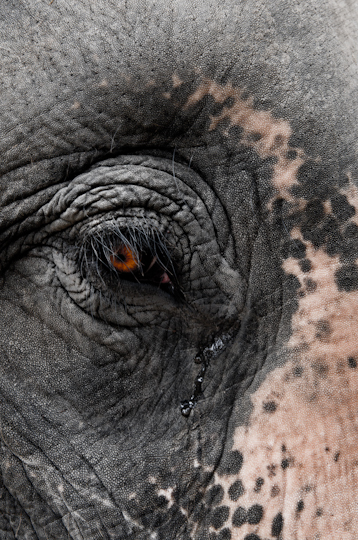 Did you know that elephants sleep only 3-4 hours a day? Well, our journey had to end here. Other than that, wandering around night bazaar and local markets, enjoying Thai massage and the spa, trying various type of Thai food is another great things to do in Thailand. 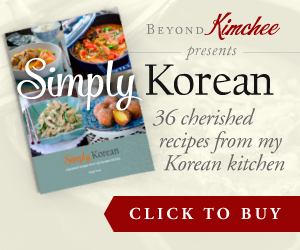 I will come back in a few days with a recipe that Koreans eat on the New Year. 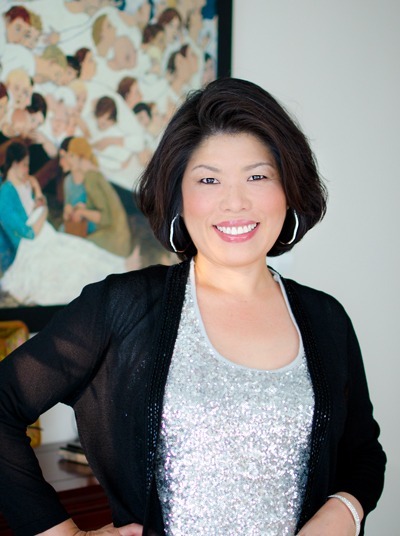 Pop Kan Mai (See you later in Thai)! Wow, amazing pictures, thanks for posting them! I haven't been to Thailand but seeing this makes me want to drop everything and jump on the first plane heading there! Beautiful! Happy New Year to you and your family! It seems that you all had a blast during your trip to Thai. Fantastic pictures as always, Holly! 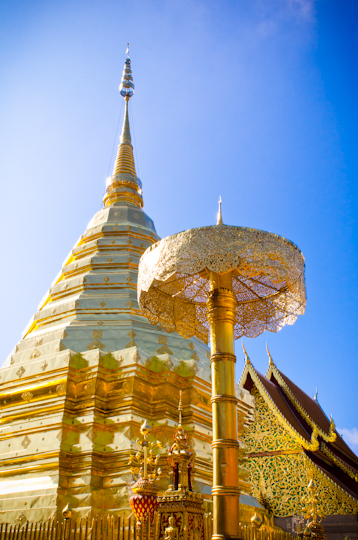 I love the golden-colored temple combined with the gorgeous blue sky. Amazing! Happy New Year to you too, Arudhi! I had a great time. I am so glad to hear that you liked the hotteok. I attended Thai cooking classes as well. I learned a few things about Thai curries and everything came out delicious. I can't wait to try at home. Thank you. Thailand is definitely worth to visit. 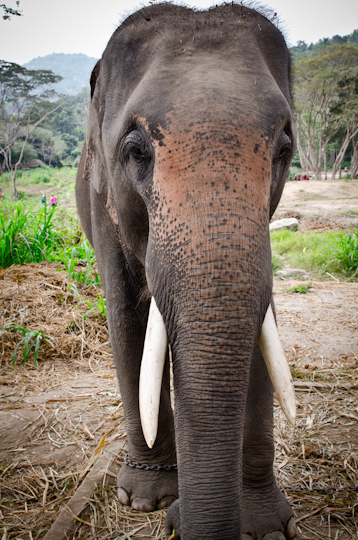 I was in Chiang Mai myself, in the second half of December and just started to blog about the travel. 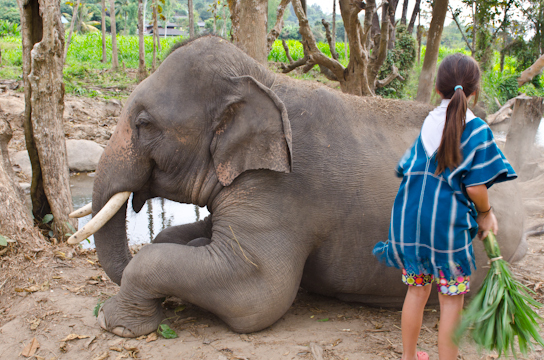 I spent only 2 days in Chiang Mai but I loved it. Nice photos! These photos are beautiful! The one with the baby tiger is adorable. All your recipes look very yummy. Glad that I came across your blog. These pictures are stunning, Holly! I like the very last one, it's like a scene out of jungle book. 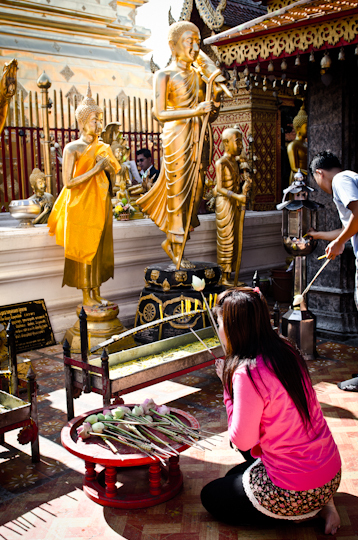 Some great pictures, Chiang Mai is a great place to travel to. It is also a great place to live!! 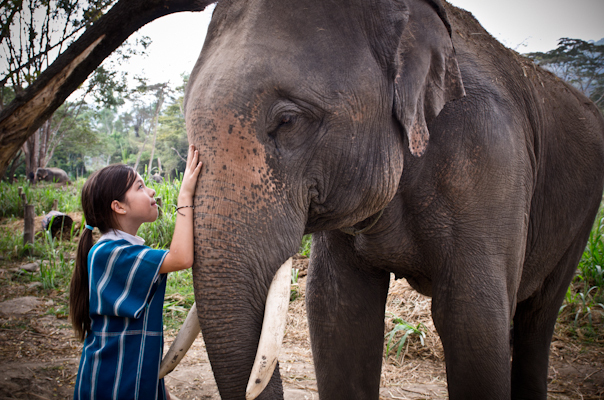 What elephant camp did you visit? It looks like you found one where the elephants are treated really well. 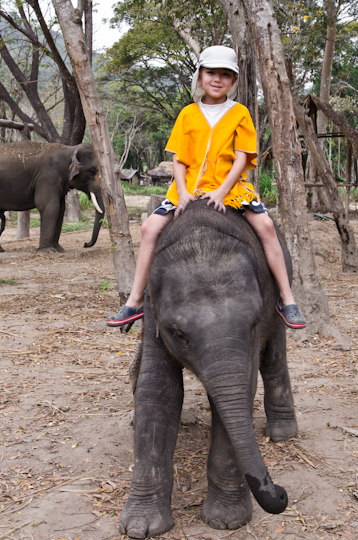 It is called Patara elephant farm. I highly recommend to visit there if you are looking for the experience. 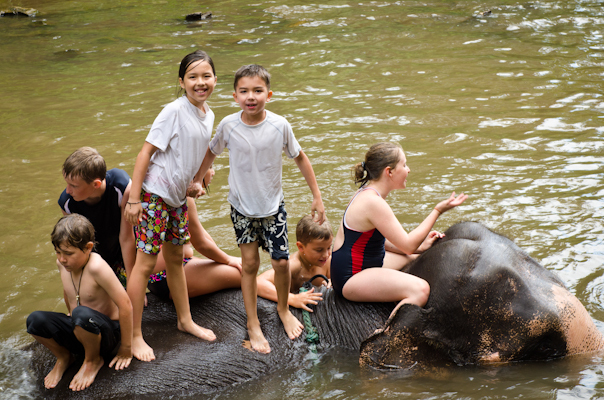 They do take care of their elephants very well, and my family had a great time learning about Asian elephants and how to take care of them. Great photos! It looks like a lovely family holiday. Thanks for sharing. Hi Holly, I gotta say this.. you have gorgeous kids.. they look so lovely .. God bless all of you. No, I didn't join any tour group but I hired a private guide/driver to take us around. He happened to be from one of the tribe and knew a lot about them. You need to be a part of a contest for one of the most useful sites online. I'm going to recommend this blog! Looking so beautiful pictures! Chiang mai is really beautiful and glorious. Thanks for sharing your pictures. 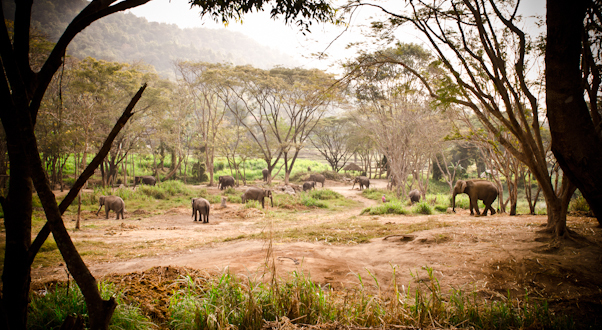 The elephant nature park is one place I really need to check out sometime. Thanks for one’s marvelous posting! I genuinely enjoyed reading it, you are a great author. I will remember to bookmark your blog and will eventually come back from now on. I want to encourage that you continue your great posts, have a nice morning!